After listening to the show a couple of weeks after, Amber declared, “this is the best podcast EVER.” You be the judge! Happy listening everyone, and cheers to the highs and lows! This entry was posted in Uncategorized and tagged freestyle libre, insulin pump, medtronic 670G, sleep and type 1 diabetes, type 1 diabetes management. Bookmark the permalink. LOL – wait until you hit the menopause years! As a T1D of 52 years, it’s like I’m a teenager again … except I have more tools to “try” to stay in the range. Boo! Haa! Haa! Great podcast everyone … and belated Happy New Year! Okay, back to listening about the 670G. Loved this episode with Mark! My daughter is almost 18, and headed to college. She’s always been a Medtronic user and adopted Dexcom early. She lives in two homes with three parents. She’s been a medical mystery her whole life. 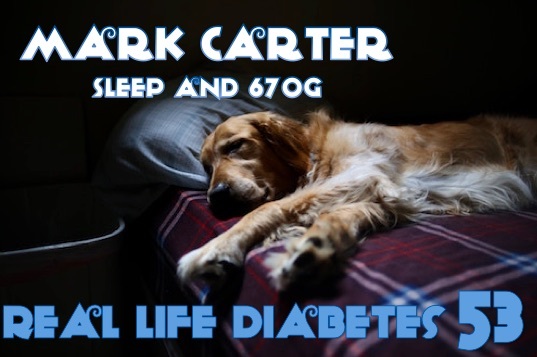 Diabetes scared us enough (hyper sensitive to activity, no shake or sweat during lows while asleep and no waking to alarms) that we never slept. Not a single night went without a parent check. 6 yrs, 3 mos. She’s been a 670g user since Halloween 2017 and continues to wear Dexcom because of share/follow. Dexcom saved her life on many occasions! Like Mark, 670g has drastically reduced overnight lows (Dexcom alarms are now few). Until Medtronic has a share/follow, she’s sticking to wearing all three. Much of her medical mystery was solved a few weeks ago, as her sleep disorder was finally diagnosed Narcolepsy. She has Dysautonomia from Ehler’s Danlos Syndrome, hypermobility, and we never put it together that’s why she’s such a squirrely T1D. The two most important symptoms – the ones that wake you up – are the ones she doesn’t get through autonomic nerve response to a dropping BG. There is no cure. We get a cure for T1D and she won’t need to be worried about it! While we were at our Children’s for the sleep/nap study, endocrinology wanted full control. AND, she’s a 670g user, so we knew she was good, but they didn’t! Thank God they didn’t take it away. We used their meter, our meter, read Dexcom and read Guardian. Neck and neck with all! The Guardian is quite reliable (although I really dislike the taping sitch). The red tape was difficult every hour we were there. We talked tech for nearly two hours with the nurses while we were there, them marveling at our knowledge and experiences. Tech updates sound like a good continuing ed class, right? I agree… it’s going to be a while before the rest of healthcare catches up to the knowledge we push ourselves to know, understand, and adopt. Lane got direct admit to a coveted spot in the Univ of Cincinnati’s nursing program! A message from Mark: I’m always encouraged when stories shared help others remember they are not alone. Lane is a diabetes ambassador to others and hopefully will continue to challenge the healthcare world, while being a nurse!!! Thanks for the feedback!